George contacted us on Saturday – just five days ago – in regards to getting a website designed for his lawn care service, GR Lawn Service LLC. He noted that over a year ago, he got a domain name registered and contacted another designer to make the site. The other designer then sent him screen shots of how the site looked and George was happy with the design. Unfortunately, the designer then disappeared and didn’t fully complete the project. To make matters worse, his main domain name – grlawnservicellc.com – had expired just about ten days prior to us starting on the site and would have cost George more to get it renewed through another domain name provider. Therefore, we were able to find a new domain name – which was shorter than the previous domain name – and took care of it for George. Since the beginning of the mowing season was just getting ready to start, George wanted to see that website come to life. He provided us with the screen shots of the pages. We then worked right away and had the first draft of the site done on Monday. A couple of changes and updates and George approved of his website! George noted in an e-mail to us, “Thank you for making it easy. I would recommend you guys in a heartbeat.“. We appreciate the business from George and look forward to a long relationship with him as we manage his domain name and website hosting as well! 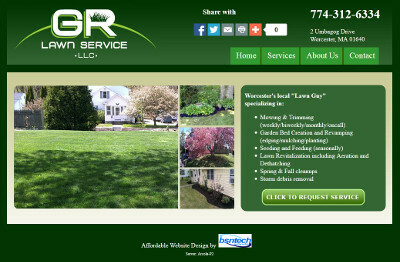 GR Lawn Service, LLC’s website is at grlawnservice.com.